Funds were raised and a suitable site was located on the edge of Ciudad Oculta. The building was renovated to serve as a daycare. Simultaneously, working with the City government of Buenos Aires, donated building materials and committed to provide all the teachers we would need. In September 2008, we opened with 4 teachers and 18 children up to 3-years old. The Little Dream – Sueñitos – was open and filled with smiling and safe children. We celebrated our first graduating class in December of 2008 in the presence of the people who had put their trust in the team. This included the City officials as well as the parents, children and local supporters. And we have grown. We now have 10 teachers and 35 children in a full-day program. During these years, we expanded to include a public adult school offering primary and secondary level classes allowing parents and others to complete their education. And free primary medical and dental care is available in the building. We have hosted wedding receptions and community celebrations. 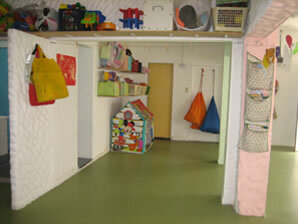 We are now a community center housing a daycare!